In October 2018, we participated at Trenchless Balkans in Sarajevo, BiH. Trenchless Balkans is an international conference and exhibition promoting condition assessment (CCTV inspection and leak detection), ground penetrating radar (GPR), cured in place pipe (CIPP) lining, close-fit sliplining, horizontal directional drilling (HDD), pipejacking, pipe bursting, auger boring, microtunnelling and several other trenchless techniques. 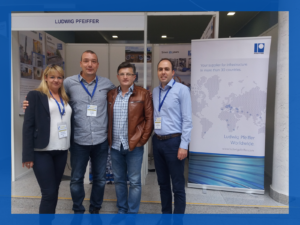 Thank you for representing our company Ludwig Pfeiffer Hoch- und Tiefbau GmbH & Co. KG at Trenchless Balkans in Sarajevo, BiH. Our team (Svetlana Vasiljevic, Ignjat Tanko, Slavisa Djuric and Rastko Jovanović) promoted the application of trenchless technologies for pipe laying and rehabilitation. Moreover, Rastko Jovanović gave an interesting presentation on this topic in front of the participants of the conference.